Jason Johnson was newly-unemployed, discouraged and facing an uncertain future when he walked into Urban Ventures’ Minneapolis offices looking for help finding a new job. 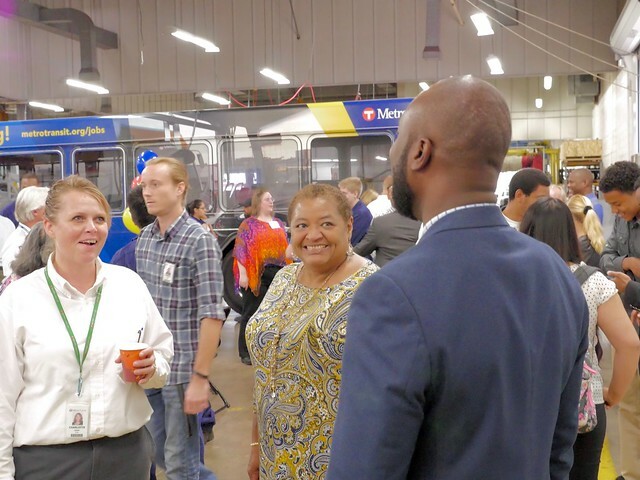 His visit came at an opportune moment: that afternoon, representatives were there promoting a new program that would offer a path toward a full-time role as a Mechanic-Technician at Metro Transit. It had been 20 years since Johnson graduated high school and worked as a mechanic with the U.S. Marines. He applied with little expectation it would amount to anything. But more than a year later, he found himself standing alongside 18 other participants who had successfully completed the first phase of the inaugural program to celebrate how far they’d come. The transformative experience is precisely what Metro Transit and partnering agencies hoped to provide in creating the Metro Transit Technician program last year. An industry first, the program combined empowerment training, tutoring and 300 hours shadowing current Mechanic-Technicians. Metro Transit, Twin Cities Rise!, the Amalgamated Transit Union Local 1005 and Hennepin Technical College collaborated on the effort. Funding came from the Federal Transit Administration. With the first phase completed, participants will now begin a customized, two-year degree program at Hennepin Technical College while continuing to work full-time as Mechanic-Technician interns at Metro Transit. The hope is that the additional training and education will lead participants to long careers at the agency, helping fill a worker shortage that is expected to grow as more Baby Boomers retire and fewer people enter the industry. More than half of the 439 Mechanic-Technicians who work at Metro Transit are over the age of 50. “The industry wasn’t supplying us the skilled workforce we needed, so what we’ve done here is essentially take it upon ourselves to build the workforce of the future,” said Gary Courtney, who managed the program on behalf of the Office of Equal Opportunity. Several longtime Mechanic-Technicians who helped guide the participants said they were proud to have played a part in introducing the participants to a profession they love. Many of the participants had no prior mechanical experience. Among those who provided guidance was East Metro Mechanic-Technician Nate Allen, who has been at Metro Transit for more than 32 years. As a mentor, Allen handed over his daily work orders, putting participants in a position where they had to ask him questions and get engaged in the work with him. The program is now being held up as a national model that could expand opportunity while helping transit agencies across the country address a growing need for skilled workers. Metro Transit has also received state funding to offer the program to another group of participants who will begin as early as this year. For participants like Ronnie Walker, who came to the program unemployed, the focus is also on what lies ahead.